I generally don’t write much about the distribution of income (most-recent example from 2017), largely because that feeds into the false notion that the economy is a fixed pie and that politicians should have the power to re-slice if they think incomes aren’t sufficiently equal. I think growth is far more important, especially for poor people, which is what I said (using the amazing data from China) in a recent debate at Pomona College in California. But some people don’t accept the growth argument. Or, to be more exact, they may acknowledge that there is growth but they think the rich wind up with all the gains when the economy prospers. So let’s review some of the evidence. We’ll start with Robert Samuelson of the Washington Post, who points out that living standards have jumped for people at all levels of income in America. …the rich are getting richer. The rest of us — say politicians, pundits and scholars — are stagnating. The top 1 percent have grabbed most income gains, while average Americans are stuck in the mud. Well, it’s not so. …the Congressional Budget Office…recently found that most Americans had experienced clear-cut income gains since the early 1980s. This conclusion is exceptionally important, because the CBO study is arguably the most comprehensive tabulation of Americans’ incomes. Most studies of incomes have glaring omissions. …The CBO study covers all…areas. …If the bottom 99 percent experienced stagnation, their 2015 incomes would be close to those of 1979, the study’s first year. This is what most people apparently believe. The study found otherwise. The poorest fifth of Americans (a fifth is known as a “quintile”) enjoyed a roughly 80 percent post-tax income increase since 1979. The richest quintile — those just below the top 1 percent — had a similar gain of nearly 80 percent. The middle three quintiles achieved less, about a 50 percent rise in post-tax incomes. And here’s the data from Samuelson’s column showing what’s happened in the 21st Century. Incidentally, economists from the Federal Reserve Bank of San Francisco explain that weaknesses in data mean that upward mobility in America is not being properly measured. …one needs to keep in mind that measured productivity growth is designed to capture growth in market activities. Thus, it may not fully capture the growth in people’s economic welfare… Measuring real growth properly is useful for addressing a host of questions. For example, existing studies use measured inflation to calculate the real income of children relative to their parents. Chetty et al. (2017) find that 50% of children born in 1984 achieved higher incomes than their parents at age 30. Adjusting for missing growth would raise the real income of children about 17% relative to their parents, increasing the fraction of those who do better than their parents by a meaningful amount. Moreover, Professor Russ Roberts points out that many analysts rely on snapshots at two periods of time when estimating changes in prosperity. Adjusted for inflation, the US economy has more than doubled in real terms since 1975. How much of that growth has gone to the average person? …Most people believe that the middle class and the poor are stagnating, treading water, while the rich get all the goodies. …these depressing conclusions rely on studies and data that are incomplete or flawed. …the biggest problem with the pessimistic studies is that they rarely follow the same people to see how they do over time. Instead, they rely on a snapshot at two points in time. So for example, researchers look at the median income of the middle quintile in 1975 and compare that to the median income of the median quintile in 2014, say. …But the people in the snapshots are not the same people. These snapshots fail to correct for changes in the composition of workers and changes in household structure that distort the measurement of economic progress. When you follow the same people over time, however, you get a much more optimistic assessment. When you follow the same people over time, you get very different results about the impact of the economy on the poor, the middle, and the rich. Studies that use panel data — data that is generated from following the same people over time — consistently find that the largest gains over time accrue to the poorest workers and that the richest workers get very little of the gains. This is true in survey data. It is true in data gathered from tax returns. Here are some of the studies… This first study, from the Pew Charitable Trusts, conducted by Leonard Lopoo and Thomas DeLeire uses the Panel Study of Income Dynamics (PSID) and compares the family incomes of children to the income of their parents.⁴ Parents income is taken from a series of years in the 1960s. Children’s income is taken from a series of years in the early 2000s. As shown in Figure 1, 84% earned more than their parents, corrected for inflation. 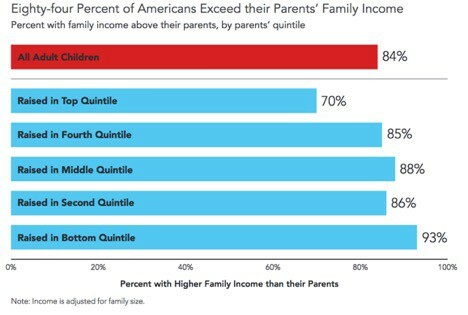 But 93% of the children in the poorest households, the bottom 20% surpassed their parents. …Gerald Auten, Geoffrey Gee, and Nicholas Turner of the Office of Tax Analysis in the Treasury Department used tax returns to see how rich and poor did between 1987 and 2007. They find the same encouraging pattern: poorer people had the largest percentage gains in income over time. For more information, here’s some data from the Pew study. Let’s also look at a column by Professor Mark Rank in the New York Times. It was written back in 2014, but his observations about people rising and falling show that there is considerable mobility in the United States. Last but not least, for those of you who really like digging into data, here’s a video from Russ Roberts about the different ways of measuring middle-class incomes. I cited some Pew data above, so I’ll close by calling your attention to the video of Pew data in this 2015 column. The bottom line is that middle-class Americans are enjoying more prosperity over time. But it’s also true that different government policies could lead to higher or lower levels of income. Which is why I’m perplexed that my left-wing friends want policies that would make the United States more like Europe. Unsurprisingly, I think we should focus instead on pro-market changes that will increase America’s advantage over Europe. P.S. The healthcare exclusion has a negative impact on take-home pay for ordinary Americans. That’s Robert Samuelson, not Paul. There’s more to true economic wealth than apparent income and the appearance of better stuff to buy. People who live in an upper middle class bubble do not appreciate how much more tenuous life has become for those on the lowest levels of society’s ladder. Back in the 1950’s people used to sing songs about trailers for sale or rent, rooms to let 50¢, 2 hours of pushing broom buying a 8×10 sleeping room. Now that life is more controlled and regimented and the economy is more monopolized and oligopolized and regulated, a person can’t just wander around getting casual jobs and living in transient quarters. Not as cheaply and not as easily. A lot of it is illegal, or priced out of reach.